In my previous post on this topic, I showed how a widget area can be added after the last list item in nav bar followed by populating this widget area with Social Media Widget plugin's widget for showing social media icons. A couple of blog readers wrote that they are having difficulty in making it work with Simple Social Icons and Dynamik and Beautiful Genesis child themes. In this article I provide the necessary code to display simple social icons floated to the right in Primary navigation bar in three themes. Needless to say, this works with any Genesis child theme with minor CSS adjustments. Use the following PHP code regardless of which child theme is active. 1) Increase the spacing between the icons in Dynamik Website Builder Gensis? 2) Get the icons to display in two rows in DWB Genesis? sure! it’s under construction but i deactivated the ultimate coming soon plugin so you can take a look. it’s in the sidebar widget area – http://www.yaelsteren.com/contact/ – you can see that they are all squeezed very closely instead of spacing out correctly. thanks so much! That worked!!! Thanks so much for all of your help and Happy New Year!!! You are welcome. Wish you a happy new year too. Thank you for this tutorial. The instructions for Beautiful worked perfectly for Pretty Pictures, too. Is there a way to reduce the space between the icons so that they are still to the right but closer together? Yes. We can write CSS for it. Can you provide the URL of your site? That’s perfect! Thank you SO much. I have been wanting to add these icons for months and could not figure it out. I’m so glad Brian Gardner mentioned you in tweet yesterday. He was spot on about how you! Hello! Thank you for writing so many amazing tutorials! I’m currently helping a friend with her blog and this is exactly what we want to do – though I can’t seem to make it work. The site is currently on under construction mode as I made edits but I can change that if you need to see it. This is probably a silly question, but do I need to fill in ‘theme_location’ as well? If so, where do I find what to put here? I’ve made the new social nav menu like you explained previously, added the PHP from this post, filled it in to match my theme (replaced ‘your-theme-slug’ with mine and also checked that the widget area matches), and added the simple social icons to the section. I’m not sure what I’ve left out other than customizing that ‘theme_location’. You do not change “theme_location”. If you want me to take a look inside to what’s wrong and fix the issue, send me your WP and FTP login via http://www.sridharkatakam.com/contact/. I know this should work for the sub nav area too but not sure how? Do I simply change nav to sub nav? Thank you so much for your tutorial. I am getting some weird styling though, do you mind having a look? http://bit.ly/1mskcpr I’d like to get rid of the space above so the menu and icons are in one line. Thank you for your fast reply. That doesnt seem to have worked! Is the php code above all I would need to create a new sidebar widget area? I read your previous post but would like to add the new sidebar without using the plugin. Is the php code above all I would need to create a new sidebar widget area? Hi Sridhar, wonderful tutorial and I’ve now got the social icons in my navbar, right, but I seem to have styling issues as my navbar has no almost doubled in height and the icons are elongated vertically as well. What do I need to style / add etc to the CSS to make my navbar stay correct, original height. My icons are set at 30px, border radius 3px in the Simple Social widget box. Any ideas? Thanks. My site is in localdev so not visible, but it’s basically that elongated issue! Need to see the site live to offer any advice. Thanks Sridhar, no worries. I’ve decided to put social icons in the utility bar up top so will avoid the problem. Utility bar functioning properly is another coding issue though! Do you have a post on that too by chance? I have a couple of posts on how to make Utility bar fixed to the top as the user scrolls down. Using dynamik and cannot get the ‘Nav Social Menu’ widget displayed in the widget area. I am using ‘dynamik-gen’ as the theme slug. Any advise would be appreciated. Thanks. Do you have to have Genesis Simple Sidebar active as a prerequisite for directions on this post? I went to the previous one and was able to get it working. Do you have to have Genesis Simple Sidebar active as a prerequisite for directions on this post? Hey Scott, make sure you have ‘affect admin’ ticked as this needs to make changes to the admin. I’d been through this tutorial several times and just could not figure out what I’d done wrong. Facepalm. Just want to say thanks for all the great information on your web site. It’s a been a huge help. Do you know how I could get them to be responsive though on mobile? Hi again, never mind. I don’t know what I did but it went to the right place so I’m just going to leave it alone, lol! Thanks again for the instructions! Thank you for these instructions — I have been looking for a solution to this for a long time! However, I am having a slight problem. The problem is that the simple social icons are below my top menu — not on the same line as the top menu. Can you suggest a fix for me? I greatly appreciate the work that you do to help those of us that aren’t as knowledgable in this arena! Thanks so much for this Sridhar! This works beautifully! How would you change this to make it work in header right. I can’t seem to figure it out. Thanks for any help you are able to provide! Hi Sridhar I just want to align the icons horizontally, because by default it is order vertically, how can I do that? http://www.gosynergy.org/ Thank you! What if I wanted to add Simple Social Icons to the secondary nav menu in the Outreach pro theme. Right now this is the best place for my needs. Hello! I’m using the Runway theme on my test site here: http://mystylevita.southernblogsociety.com/?p=1. I added the code for the secondary menu so my social icons show up when the sticky second menu engages (same menu but just the location is secondary instead of primary) and it works beautifully! However, I was wondering if it’s possible to make the PHP so that the social icons show up on both the primary and secondary menu? That way they dont randomly show up on the secondary menu when a visitor starts scrolling. I know nothing of PHP code so I sincerely appreciate your help & wonderful tutorials! How do you control how far right the icons float in the navbar? Hi Sridhar!!! The code you provide for the Simple Social Icons added to the nav bar is PERFECT! Do you have a code for adding it to the Secondary Nav Menu instead of the Primary one? Just replace primary with secondary in the PHP code. Great tutorial, but how do I get them to show up in the secondary menu? I used the studiopress tutorial to have that menu at the top of the screen, but I can’t get the social icons on it. I followed sort of same tut by Bill Erickson, for adding items to Genesis Nav, but it didn’t work. Your seems to be using one different thing – ob_start and ob_get_clean. Can you please explain the significance of these two in your code. Thanks. In general, it is to be avoided when possible. Think of it like the negative margin of CSS. 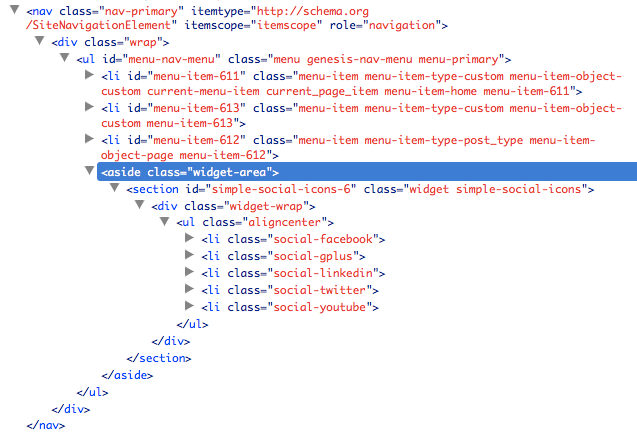 Hmmm, I followed your directions for Genesis/Dynamik Website Builder but the “nav social icons” widget never appeared. I put exactly the right code in both Dynamik’s “functions” area and the proper CSS in the right place too. I’ll gladly provide an admin login for you if you can peek into the back-end of the website. I can’t wait to get this working as it is exactly what I need on this particular site – a Facebook button inside the nav just to the right of the standard nav menu items. Can you provide the URL of your site? I have just tested this code and it’s working fine in Dynamik. Note that the social icons widget is supposed to appear in the WordPress menu that’s assigned to the Primary Navigation Menu location, not in other places like a Nav menu widget placed in Header Right widget area. I have exactly the same problem as above…the “nav social icons” widget hasn’t appeared after adding the PHP to the custom functions area. It is there now. I had to tick the Custom Functions (Affect Admin) box and save again. I’m sorry Sridhar, I assumed you knew my website URL was linked to my name (I entered it into the “website” field on this form). It is http://www.jasondavis.com/liprip/ The site is not live yet. However, I did get it to work when I followed Zelky’s lead and checked “Affect Admin” in Genesis Custom>Functions. Unfortunately as the Cobalt Apps documentation warns below, I am not confident in my coding skills and I’m not comfortable leaving the box checked. I’ll wait until I’m done with the site and then put this into effect as a last step when I have no other functions to add. Thanks for everything, as always! If you’ve enabled the “Affect Admin” option and end up adding some code that temporarily “breaks” your site you can fix this by removing the bad code from your /wp-content/uploads/dynamik-gen/plugin/custom-functions.php file, and then removing that same bad code from your Dynamik Custom > Custom Functions. Manually updating the custom-functions.php file gets you back into your WP Dashboard while updating your Custom Functions options helps prevent your site from re-breaking after saving your changes. I was playing with this setting yesterday and noticed that social media widget continued to appear after unchecking it. So you might want to try it out. Now I’ll have to figure out how to adjust the CSS to get the Facebook icon (I’m only using that one icon in the menu) to be just to the right of the navigation menu, which was also made much taller than it was before the social icons widget appeared in the nav. Wish me luck! Yael, the Gravity Forms plugin on your contact page is disabled. We currently see the short code when visiting the contact page. You are the best. Thanks as always! My theme is swank child. How can I have this work for both the primary and secondary nav? In the code added in functions.php, try deleting http://pastebin.com/raw/fjvyndV2. I tried implementing this in Digital Pro, but I’m having trouble getting the search and icons to line up with the primary navigation menu (right now, it’s directly underneath it). Can you assist? For reference, it’s here: http://seventh-row.com. I am having a weird issue with this in Infinity Pro. I can see in the page source code that it’s working, it inserts the proper and other code, however it is not visible. I triple checked all CSS and there is nothing that should prevent it from displaying, yet it’s not showing up. Unfortunately the site is local only, not on a live server yet, otherwise I would share the URL. Do you have any thoughts? Or can you try it on Infinity Pro? I’m using WP 4.6.1 and latest Genesis. I’ll give it a try tomorrow and post an update. I’ve been trying to get my search bar and social icons to line up with my menu but if I use CSS to move them up (transform:translate), they get hidden beneath my menu. The fact that it’s lower also seems to be hiding part of my main page, which is causing formatting problems throughout. Can you assist? You can view it here: http://seventh-row.com. Never mind! Figured it out. I love this tutorial and have it working well. But I was wondering if there was a way to keep the social icons always showing even on mobile (versus having the user click the mobile menu icon to see them). So still have the hamburger icon for the menu items, but have the widget contents showing below even when the responsive menu is closed? I’m using the Altitude Pro latest version theme. Yes. Follow https://sridharkatakam.com/add-simple-social-icons-altitude-pros-header/ instead of this.